For a stretch in 2008, Marc Verica looked like the second coming of Matt Schaub. Running Mike Groh’s West Coast offense, Verica passed for 200 or more yards in six straight games, and led a Virginia team that had stumbled out of the gate to a 1-3 start to four straight wins and a brief run as the leaders in the rugged ACC Coastal. Four straight losses to end the ’08 campaign brought the Verica juggernaut back down to earth, and the QB spent most of the 2009 season as the third-string signal-caller under new offensive coordinator Gregg Brandon. Brandon is gone, Al Groh, the embattled head coach who never could decide what to do with his offense after losing wunderkind Bill Musgrave to the NFL early in his tenure, is gone, too, and Verica, a fifth-year senior, heads into training camp as The Big Man on Grounds. “It makes a big difference going into the season knowing that you’re going to be the starter, that you have the support and trust of not only your teammates, but the coaches,” said Verica, the only veteran quarterback on a depth chart that includes a redshirt freshman (Ross Metheny) and a true freshman (Michael Strauss). Verica being #1 on that depth chart is a confidence boost, he said at last weekend’s ACC Football Kickoff, but more valuable is the fact that being #1 means he gets extra reps with the first-team offense. “That is completely necessary to prepare and be in the kind of shape physically and mentally to be ready for the speed of the game,” said Verica, for whom whatever issues there were at the tail end of his run as a starter didn’t seem to have an issue with the speed of the game, throwing for 2,037 yards and eight touchdowns while completing 63.8 percent of his passes. The issues that had Virginia fans thinking that Verica was done before his time were in the area of confidence. Verica ended 2008 on the bench for much of the Virginia Tech season finale as Vic Hall took the majority of the snaps at QB in a one-trick-pony Wildcat formation, and was reduced to mop-up duty in 2009, appearing in six games and throwing for 156 yards while completing just 44.4 percent of his pass attempts. 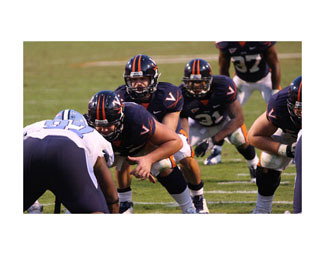 New offensive coordinator Bill Lazor brings a new approach to the UVa. offense. The 2010 Cavs will re-emphasize the running game that was shut down internally by Brandon, and the new sets will also utilize the tight end, long a strength at Virginia, with senior Joe Torchia expected to play a big role with his size (6-6, 250), speed and pass-catching abilities creating mismatches with opposing linebackers and safeties. The past, for Verica, is the past, the good and the bad. “Now I find myself heading into my final year as a leader on this team and the quarterback, and I’m embracing that. I’m having a great time. I’m excited for it,” Verica said.